I have lived in Metuchen, NJ, all my life. I have been married to my wife Patricia since 1977. I am a former newspaper editor and reporter. I was also the owner-operator of my own small business for several years. I wrote various novels and short stories published during 1980s and 1990s. I am a long-time student of judo and Japanese swordsmanship (kenjutsu). I also play chess, basketball, and military and sports simulations. Something tells me I’d better introduce this as satire–only because it’s getting harder and harder to tell satire apart from reality. Are there really Reputable Bible Scholars who don’t believe a single word in the Bible is true? And while we’re at it, is Hillary Clinton a crook? Is birthday cake fattening? Susan asked for this–By Faith, by Keith Getty and Stuart Townend, sung by Keith and Kristyn Getty: a hymn that picks up where Hebrews 11 leaves off. “Walk by faith and not by sight”–it would be a good thing, to know how to do this. Prayer will be part of that answer, I think. Violet Crepuscular introduces Chapter CCLXXXVII of her epic romance, Oy, Rodney, with a flourish: “Dear reader, you have surely been wondering what Johnno the Merry Minstrel has been doing while Lord Gromleigh and Lady Petunia, who is Lord Jeremy’s aunt, married to the Marquess of Grone, have been visiting Lord Jeremy at Coldsore Hall. If you haven’t, I fear you may be losing the thread of the story.” To say nothing of the thread of that sentence. Well, Johnno has been busy in Scurveyshire’s Library of Forbidden Books. No one is allowed to go in and see the books–they are, after all, forbidden–but Constable Chumley has been so busy studying moles, he has rather neglected his duty to watch over the library and see that no one enters. In fact, it has been quite a long time since he paid any attention to it at all. At dinner that evening, Johnno is called upon to perform Lady Petunia’s favorite song, I’ve Got Rabies, singing it while also playing it on his harmonica. This puts everyone into a festive mood except for the marquess, who wanted kippers for supper and didn’t get them. “Kippers, I shouldn’t wonder!” grumbles Lord Gromleigh. Johnno takes a moment to beam beamingly, then answers. Here Ms. Crepuscular accommodates the reader with a picture of an antimacassar. Three of them, in fact. I’m sorry, but I just can’t get enough of this hymn–Up From the Grave He Arose, sung by the Voice of Eden, from somewhere in India. Wow! We have family in India, and some of them can sing up a storm. Christ’s resurrection changed the world. As the hymn tells us, “Death cannot keep his prey.” Jesus has broken its chains forever. 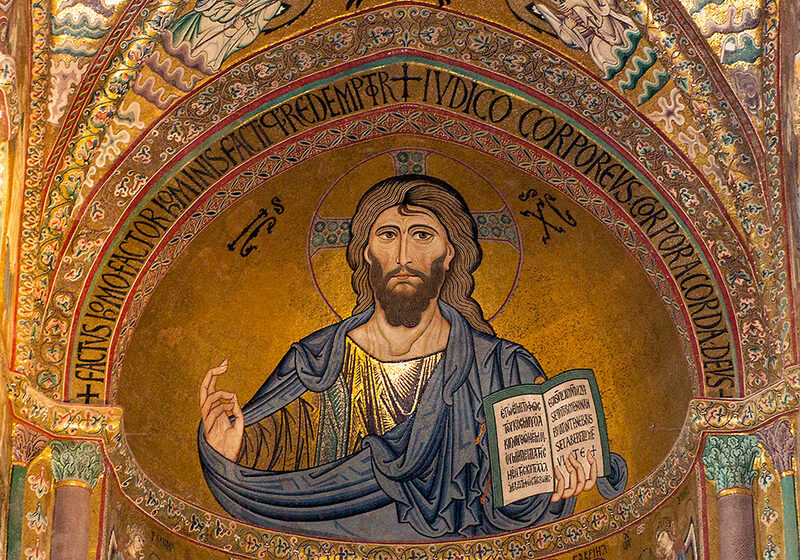 This is Christ Pantokrator, “Christ the Ruler of All,” as portrayed in an ancient church in Sicily. Today on Easter Sunday we celebrate His resurrection from the dead. Or Lord our God, and Father of All: grant this Easter day of 2019 power to work all throughout the year, every day, to draw our hearts to Jesus Christ–by whose blood we are saved, by whose wounds we are healed; Jesus Christ, our rightful King and only Savior. Do as thou has said, O Lord! Make His enemies His footstool, put all things under Him, make all things new and wash away all tears: we pray for the restitution of all things, under the Lordship of Jesus Christ the King of kings. In Jesus’ name, Amen. Requested by Erlene: O Lord, You’re Beautiful, sung by J. Michael Finley as part of the movie soundtrack for I Can Only Imagine. God the Father reconciled Himself and us in the person of Jesus Christ, both Son of God and Son of man. I haven’t seen the movie, but I’m told it’s about forgiveness. So is Easter. So is the Christian life. We can’t do without it. And even as God forgives us, He calls us to forgive each other. Can you imagine it? Hard enough to imagine knowing Jesus Christ as He walked in the flesh, hearing His voice, seeing what He did. Surely this was the Messiah–wasn’t He? Who else could do such things? And then they killed Him. And you saw that, too. Try to imagine Mary Magdalene on Easter morning, the first of all to see the risen Christ. Of course she didn’t recognize Him at first: He was dead. But when He spoke her name, she knew Him. Can you put yourself in her place? Maybe not–but well worth trying. It’s an Easter tradition here to post this scene, from The Greatest Story Ever Told, of Our Lord Jesus Christ raising Lazarus from the dead. For which the Temple authorities sought to kill Him. He did this for all of us, so that we would believe that God had sent Him. The Eohippus, “Dawn Horse” (aka Hyracotherium), comes to life in one of my favorite movies, The Valley of Gwangi–another wonderful special effect by the stop-action wizard, the late great Ray Harryhausen.